In 1994, Steve Wilson was a towing master, who spent much of his time on the sea away from his wife, Wendy, and their three children. He loved the water, but he loved his family more. So, they prayed for God to give them a new direction that would allow them to pursue their dreams while sharing more time together. That humble prayer led them from Ocean Springs, Miss., to Destin, Fla., where they would become pioneers of the local dolphin cruise industry. But they couldn’t find a vessel, so again they turned to prayer. One day shortly thereafter, a man from Long Island, N.Y., called out of the blue and said, “I’ve got your boat.” So Steve sailed the original 65 ft. converted wooden fishing boat from New York to Florida and began offering dolphin-sighting cruises off the Destin Harbor. The new boat is very spacious and comfortable, with plenty of room to be seated or to move about. It features a climate-controlled cabin, as well as ‘real’ restrooms, a gift shop and snack bar. Dress comfortably and casually. Heels are not recommended, but neither are they forbidden. You do your thing and let the dolphins do theirs. 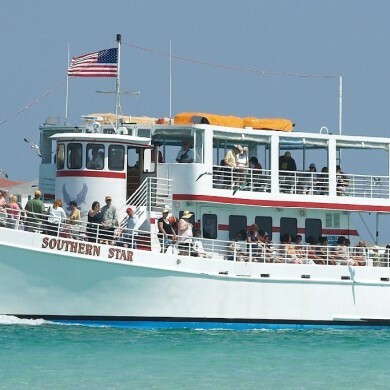 The Southern Star offers group and military rates and is available for school field trips, private parties and special events including weddings. She cruises year-round, but never on Sundays. After all, that’s when the Wilsons thank God for giving them a ‘Star’ to follow. To book your cruise today, please visit the Southern Star website or call (850) 837-7741.